Design Ideas – Building a solid reputation one happy customer at a time, Prestige Construction LLC is skilled in transforming basements from dark, dingy storage spaces into bright, cozy living areas. They’re committed to designing a finished basement that suits your lifestyle and needs, no matter what the existing conditions. Basement finishing projects provide you with additional space, and the design experts at Prestige Construction LLC will ensure that space is built with you in mind. Knowledge & Skills – You may come across some serious challenges during a basement remodeling project. Water damage, heat distribution and lighting difficulties are only a few examples. 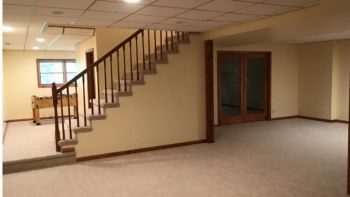 Trust the staff at Prestige Construction LLC for the answers to any basement renovation challenge. Years of experience and industry know-how provide them with the skills and knowledge to finish your project the right way. Affordable Prices – Many people are tempted to try DIY basement renovations in an effort to save money and realize their basement remodeling dreams. Why spend all of that time learning and experimenting with new home improvement jobs, when you could hire Prestige Construction LLC to tackle this job for you? Surprisingly affordable prices and superior material choices will help you create the basement you’ve always wanted, quickly and without hassles. Imagine having more space without the expense of a home addition. Basement remodeling projects from Prestige Construction LLC are designed with your lifestyle in mind. Prestige Construction LLC offers extensive knowledge and skills, with affordable prices to convince even the most dedicated DIY enthusiast. Call (219) 213-6336 for a free estimate and get started on basement renovations that will add space and comfort to your home.